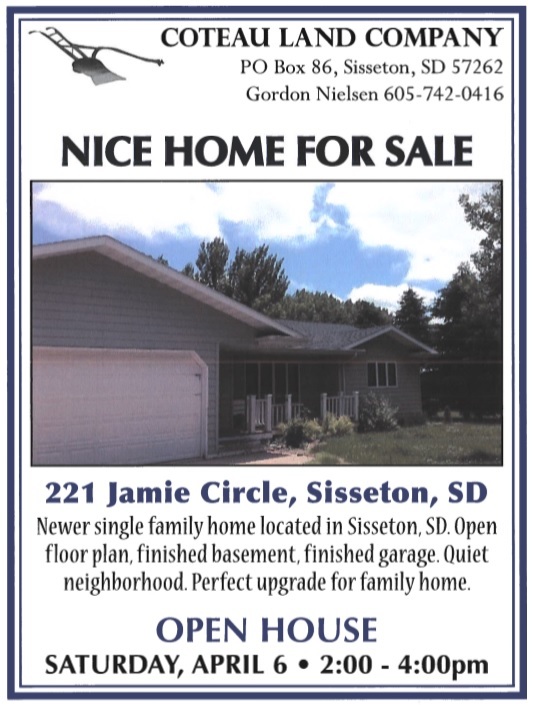 Newer single family home located in Sisseton, SD. Open floor plan, finished basement, finished garage. Quiet neighborhood. Perfect upgrade for family home. will need to have Adobe Acrobat Reader installed to view them. "This information contained herein is furnished by the owner to the best of his knowledge, but is subject to verification by the purchaser, and agent assumes no responsibility for correctness thereof. The sale offering is made subject to errors, omissions, and change of price, prior to sale or withdraw without notices. In accordance with the law, this property is offered without respect to color, race, national origin, familial status, or creed. ""This information contained herein is furnished by the owner to the best of his knowledge, but is subject to verification by the purchaser, and agent assumes no responsibility for correctness thereof. The sale offering is made subject to errors, omissions, and change of price, prior to sale or withdraw without notices. In accordance with the law, this property is offered without respect to color, race, national origin, familial status, or creed."